A: You can choose from either a skin mount or a reproduction fish when preserving your trophy. It is by combining the working knowledge of both mediums that we are able to more easily accommodate your needs. A: From freshwater to saltwater, we have done many different species of fish. If it was legally harvested, we can mount it. Q: What information do I need to provide for a fiberglass reproduction? A: If you intend to release your fish, we will need the information outlined in “How do I measure for a reproduction” below. Q: How do I measure for a reproduction? A: Take a measurement of the length from tip of the tail to the tip of the mouth. In addition, take a measurement of the girth (around the fish at its largest point). Take photos.— Take photos. Good photographs will enable us to create an accurate fiberglass reproduction of your fish. Q: What if I don’t have flexible tape to measure with me? A: No problem, use fishing line. Stretch a piece from head to tail and cut it at these exact points. Wrap a piece around the fish at the largest point and cut where they intersect. Save pieces and measure them at a later time. Good quality pictures are also very important. Q: Can or should I send a photograph of my fish? A: Absolutely, If you send a photo, we can look for details and special characteristics of your individual fish. Photos are especially important when recreating a reproduction fish. 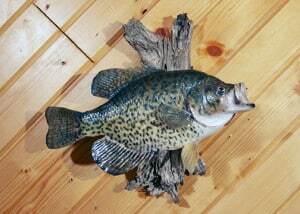 We work hard to produce a detailed, life-like trophy fish mount. To help us ensure the final result faithfully reproduces your catch, be sure to document any unusual things about your fish that you notice if you want it added to the finished product. Be sure to take a photo of the fish as soon as possible once it is caught. Q: How do I ship a frozen fish? A: Shipping methods can vary on outdoor temperature, distance and location of shipment. Contact me for specific instructions on shipping your trophy. A: All finished fish mounts, whether they are fiberglass replicas or skin mounts, should be kept out of direct sunlight to reduce fading from UV light. They also need to be dusted to keep that “just caught” luster. Q: Can a mounted fish be repainted or repaired? Q: What are some examples of habitat that I can choose? A: Driftwood is the most common object used in fish mounts; however, your imagination is the limit. We can add anything you desire. A: Prices vary according to the species and size of the fish, and any extras such as panels, driftwood, background or the habitat involved. Q: Can you ship my completed mount?